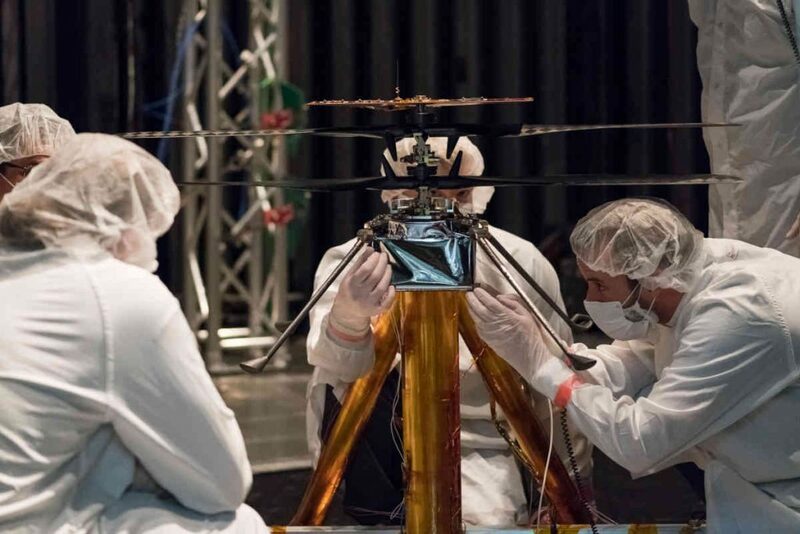 NASA has completed tests on the flight model of its Mars Helicopter, an autonomous demonstrator rotorcraft, which is scheduled to launch toward the Red Planet in July 2020 as part of the space agency’s Mars 2020 Rover mission. 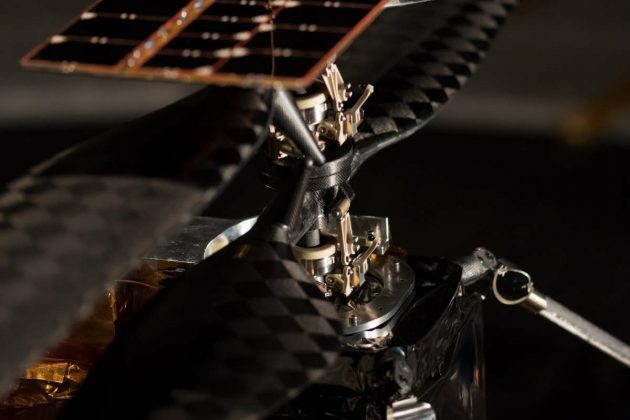 Testing on all of its final parts began in late January 2019 at NASA’s Jet Propulsion Laboratory (JPL) in Pasadena, California. The Mars Helicopter will be stowed in the belly pan of the Mars Rover, which will be the primary payload on board the United Launch Alliance Atlas V rocket. Under the current timeline, the entire payload is expected to reach Mars in February 2021. This is an optimum – cost-saving – launch window based on the relative positions of Mars and Earth, perhaps best illustrated by the fact that NASA in mid-February 2019 had already started aero-braking procedures to reposition its MAVEN spacecraft, currently orbiting Mars, in preparation for the arrival of the 2020 Rover. 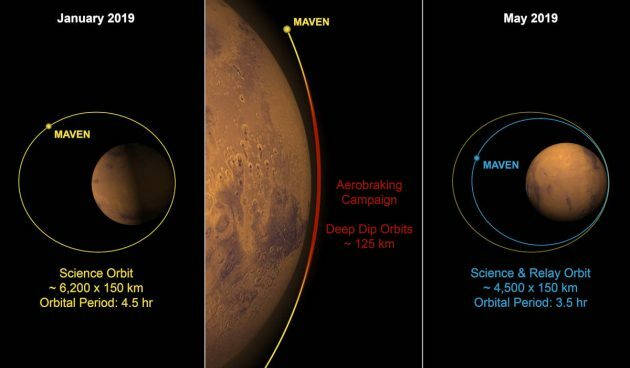 The highest point of the MAVEN’s elliptical orbit, according to NASA, will be reduced from 6,200 to 4,500 kilometres above the planet’s surface to serve as a data-relay satellite for the Mars 2020 Rover mission. This increases potential coverage of the rover’s landing site, Jezero Crater, with orbits of Mars increases to 6.8 per Earth day versus 5.3 previously. Described by NASA as an atmosphere-sniffing spacecraft, MAVEN – Mars Atmosphere and Volatile Evolution, built and operated by Lockheed Martin – will continue its primary mission to study Martian climate evolution. Based on geological features, such as riverbeds and other obvious liquid-driven erosion, scientists believe Mars has lost 99 per cent of its atmosphere due to planetary shifts and solar wind. Started in August 2013 as a development project, the Mars Helicopter weighs approximately 1.8 kilograms (four pounds) with a fuselage that NASA describes as about the size of a softball. The rotorcraft will be deployed a few months after landing on Mars as the Rover finds a suitable location to place it on the ground. NASA explains the rover then will be driven away from the helicopter to a safe distance and begin to relay commands. Its batteries will then be charged, tests performed, and controllers on Earth will command the Mars Helicopter to take the first test flight from the surface of another planet. NASA is planning – conservatively, of course – for a 30-day flight test campaign with up to five flights of incrementally farther distances, up to a few hundred metres and duration as long as 90 seconds. On its first flight, NASA explains the helicopter will make a short vertical climb to three metres (10 feet), where it will hover for about 30 seconds. The Mars Helicopter employs twin, counter-rotating blades rotating at almost 3,000 rpm, described by NASA as a rate that is about 10 times faster than a helicopter on Earth in order to bite into the Martian atmosphere. The majority of testing on the flight model focused on how it could operate on Mars, including performance at Mars-like temperatures. The helicopter will need to survive and function in cold temperatures, including what NASA pegs as nights reaching as low as minus 90 degrees Celsius (minus 130 degrees Fahrenheit). The Mars Helicopter contains a heating mechanism to keep it warm during the Martian nights, in addition solar cells that charge its lithium-ion batteries. To put the planned helicopter demonstration in perspective, Aung explains, that because the atmosphere of Mars is only one per cent that of Earth’s, a helicopter on the Martian surface is already at the Earth equivalent of 30,480 metres (100,000 feet) in altitude – with the altitude record for a helicopter flying on Earth at about 12,192 metres (40,000 feet). The Mars Helicopter team leveraged JPL’s Space Simulator, a 7.62-metre-wide vacuum chamber, for its flight testing. NASA explains the team created a vacuum to remove all of the nitrogen, oxygen and other gases from the air inside the Space Simulator’s cylinder and then injected carbon dioxide, the chief ingredient of Mars’ atmosphere. “To make it fly at that low atmospheric density, we had to scrutinize everything, make it as light as possible while being as strong and as powerful as it can possibly be,” said Aung, when the demonstrator’s inclusion on the mission was first announced in May 2018. NASA is quick to point out, that as a technology demonstration, the Mars Helicopter is not critical to the Mars 2020 Rover mission – positioning the autonomous rotorcraft as a high-risk, high-reward project. As part of NASA’s robotic-driven Mars Exploration Program, two primary objectives of the Mars 2020 mission include seeking out signs of habitable conditions on Mars in the ancient past, as well as searching for signs of past microbial life. The rover includes a drill that can collect core samples of rocks and soils. These will be set aside on the surface of Mars with the potential for a future mission to return any samples to Earth.